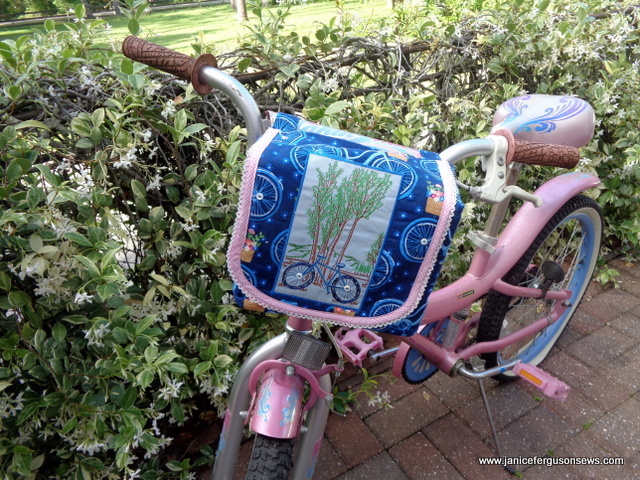 The bike bag is a perfect match to my granddaughter’s bike. What a lucky coincidence! Detailed instructions are available here. For that special biker (your child, your grand, your mother, yourself?) who has everything, how about a pretty quilted bike bag. 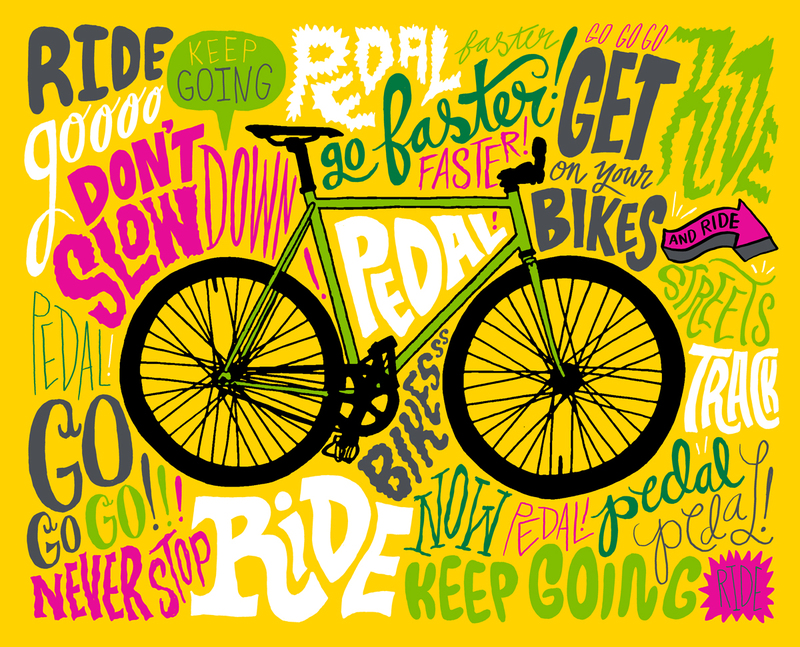 This was a fun project, made for Brother’s blog, Stitching Sewcial, in celebration of National Bike Month. Detailed photo instructions are included in the tutorial post. I’ve loved this design since it was first included on a Brother card, EDB LG1. Now it is available as a single design at iBroidery.com for 5×7 frames. The scenic design has white negative space, which would have made the stitching disappear into the fabric print. So the file was converted to an applique’ and stitched on sky blue pique’. 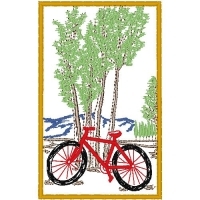 The blog post gives directions for converting this and other framed designs to applique’. My husband used to take the children long bike hikes. One of their favorite destinations was Hontoon Island State Park, 15 miles from home. They would relax there at a little snack bar overlooking the St.John’s River and enjoy a cold drink. Then they would call me to pick them up. After the first seven miles, I’m sure they would have loved to reach into a bag like this for a bottle of water to quench their thirst. 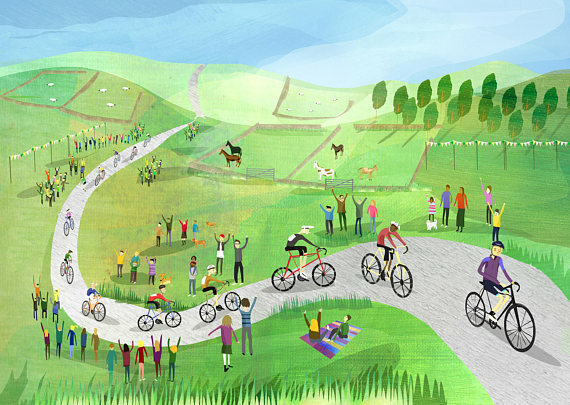 This project is unique in that it is gender neutral and age appropriate for anyone who rides a bike. Did you know May 18th is officially Ride your Bike to Work Day? Please tell us about it if you do. NOTE: I am required to let you know that I am a paid sewing consultant for Brother. If you happened to stop by these past two weeks, you must have thought I have dropped off the face of the earth. Though very busy, I have managed to stitch a few things that I would like to share with you. Today I’m showing a feminine drawstring bag. 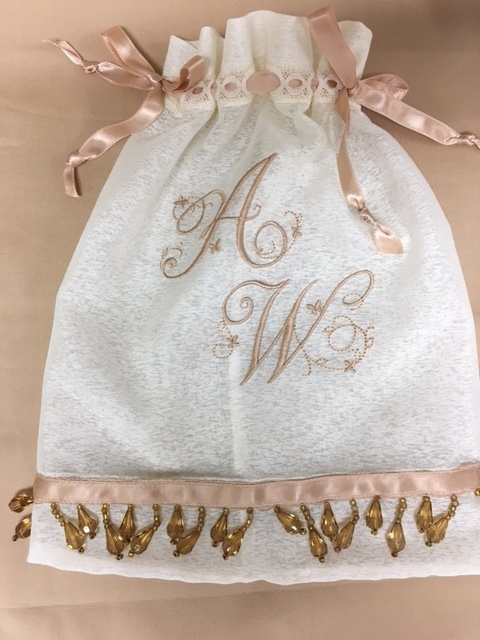 This is a bride’s gift to her bridesmaid, stuffed with a few precious momentos, reminders of the young ladies’ time together and a matching monogrammed handkerchief. After the wedding, the bag can hold more handkerchiefs or whatever pretties that need a container. The fabric is a lovely organza from fabric.com. The fabric was cut 10″ x 16″. With a width of 118″ 7 bags can be cut from 1/3 yd. with plenty of room to straighten the fabric edge. 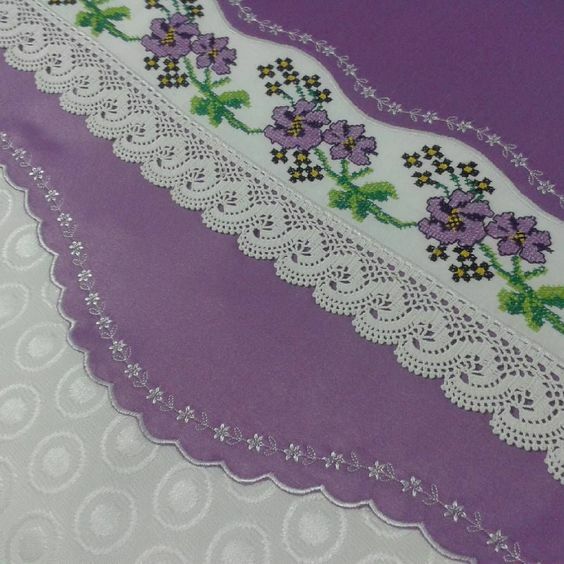 In order to show off the ribbon, ivory French lace beading was used instead of a casing. The beaded trim was originally joined to a dark brown twill base. After it was stitched in place, the taupe colored satin ribbon stitched on top of it. The same ribbon was used for the drawstring ties. Thread for the monogram was chosen to match the ribbon. I love a quick project every now and again. 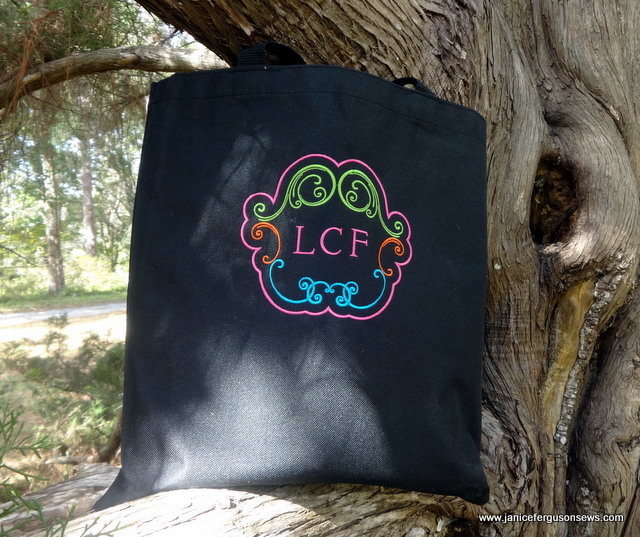 This same bag could be purposed for so many other uses–bridal showers, birthdays or any gift occasion. It’s nice to have a simple project to make up in a hurry when the need arises. Then try stitching a pretty bag like this. This is a question I have struggle with frequently. Does EVERY project require or deserve perfection? 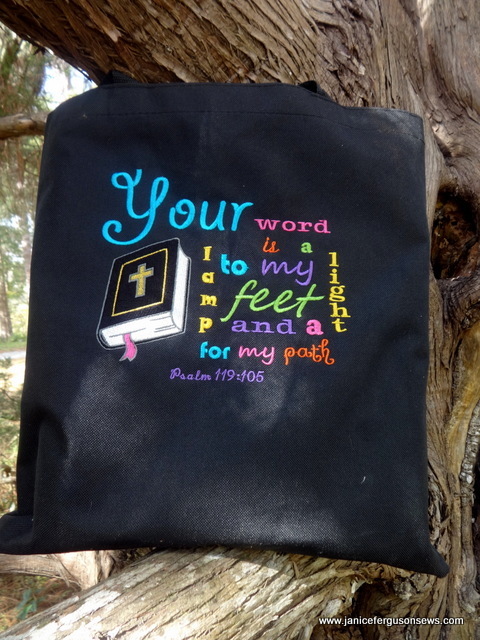 Most recently, my struggle focused on the party favor bags for my grandson’s 8th birthday. The party had a sports theme, with a football pinata and soccer field cake. My contribution to the festivities was 12 teepee bags (click here for the post with the free pattern) 3 each from football, baseball, basketball and soccer novelty fabrics. After enjoying the bounce house and the girls swapping clothes and changing again and again with the garments in the dress up box, the bags were stuffed by the children with the spilled contents of the smashed pinata. Like most of you readers, I am very, very busy. But I am also very, very fussy about my sewing. Often I ask myself, is it better to sew more with a few imperfections or better to sew less and get my projects as close to perfect as possible? In fact, I rarely achieve results even close to perfect. I wrestled with this question when making the quick and easy bags , which take 10 minutes each without finishing touches. Two of these touches include topstitching the zipper, finishing the seams and trimming stray whiskers from the seams. Ultimately, taking time to cut out and make each bag unique (who wants mass produced?) with different colored zippers and handle loops, winding different colored bobbins and changing threads, I spent about 20 minutes each. But was it worth it? Do the seams really need to be finished for a candy bag? Must the stray thread be trimmed?. In search of the answer, I did not sit in my Adirondack chair under a freshly leafed oak tree on a sunny Florida spring afternoon. Remember, I am very busy. Oops, I think I already mentioned that… Instead I contemplated the quotes below while folding laundry, feeding the cats and scouring the kitchen sink. Confucius said, “”Better a diamond with a flaw than a pebble without.” Hmmmm…. Plato really muddied the waters with his declaration, “Better a little which is well done, than a great deal imperfectly.” Hmmm…again and again. Then, many quotes addressed the subject of excellence along with perfection. Ultimately, it was the wisdom of a football legend who spoke to my heart. 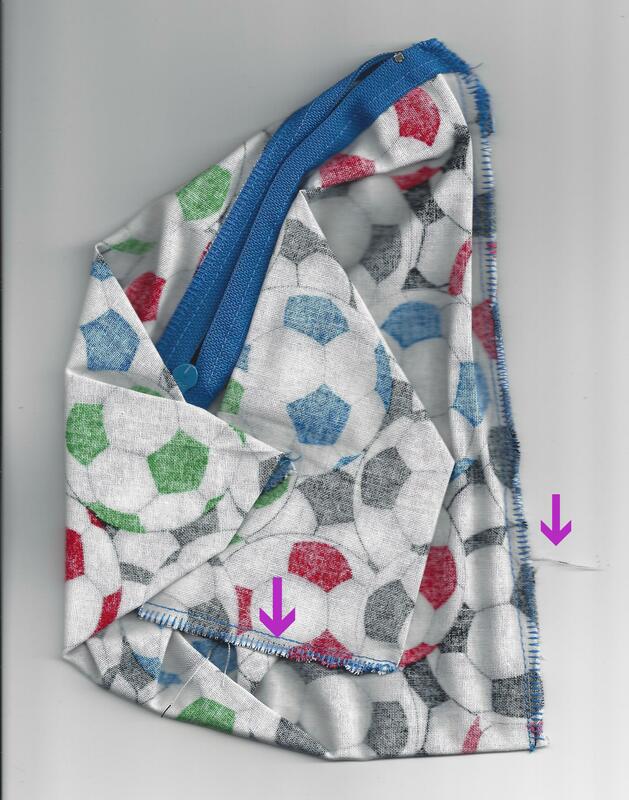 As you can see from the photo of the single soccer teepee bag, the seams were finished, the zipper was topstitched, and finally the stray threads. were trimmed. I’m not sure it was the wisest expenditure of my time, but I couldn’t help myself. I’ve decided that I am in search of excellence in all I sew rather than demanding or expecting perfection. Whew! That’s a relief! Part 1 of the 3-part detailed tutorial for the set is now posted here at Brother’s blog, Stitching Sewcial. What a fun project this was! Disney’s machine embroidery designs at iBroidery.com reflect the awesome and mighty protector Elliot who has greater appeal for today’s action hungry youngsters. While the ’70’s version featured the sweet but goofy purple cartoon dragon Elliot, this 2016 dragon is the real deal. See the trailer here. 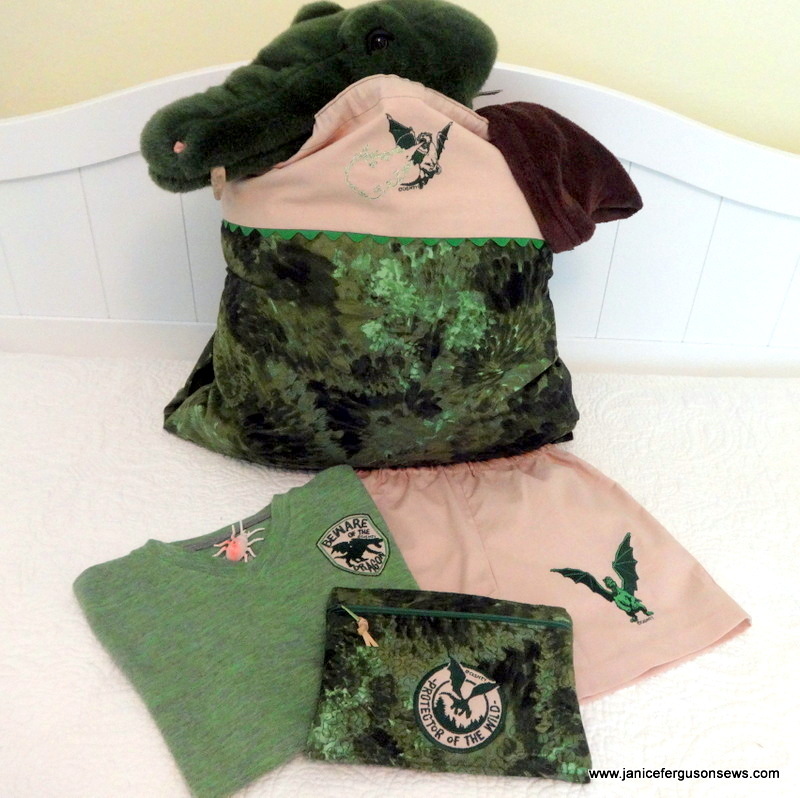 The set includes an a stippled sundry bag for his toothbrush and personal grooming items, embroidered shirt and shorts pajamas set, and a pillowcase with a burrito/turn tube hem. A drawstring makes it a tote for carrying all his gear to a sleepover. You can see that the buttonhole is empty. For the child’s safety, the drawstring must be removed when the tote becomes a pillowcase. 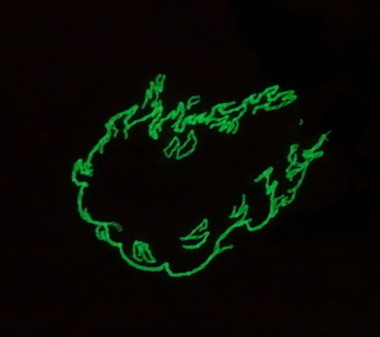 Each of my 4 grandchildren are fascinated and delighted by glow-in-the-dark embroidery. 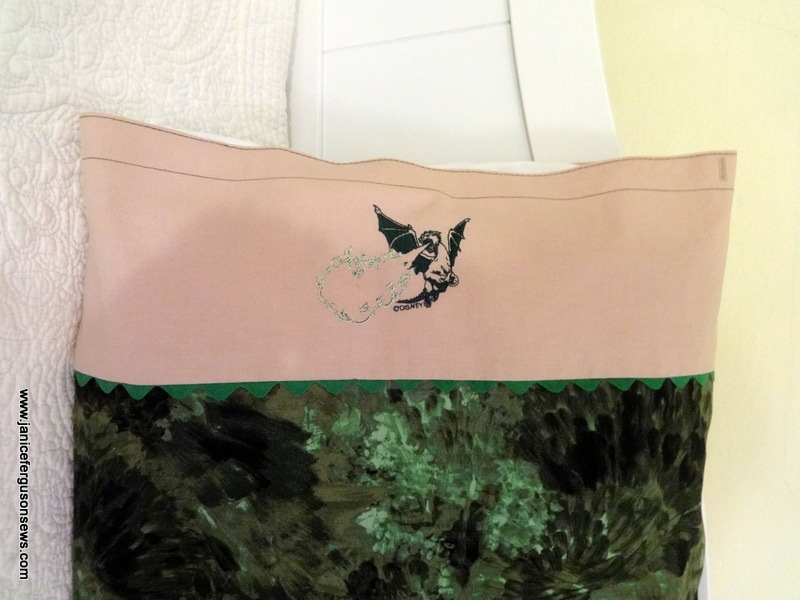 Why not try it on this pillowcase/tote? Part 1 of the tutorial is now posted here at Brother’s blog, Stitching Sewcial. Yeah! My personalized Disney Alphabet laundry bag tutorial has just been posted on Brother’s blog, Stitching Sewcial. It was a fun and enjoyable project. Those alphabet characters are cute as can be. I felt like a real in-the-know and up-to-date Nana when I recognized most of characters. I’m studying up on the others. 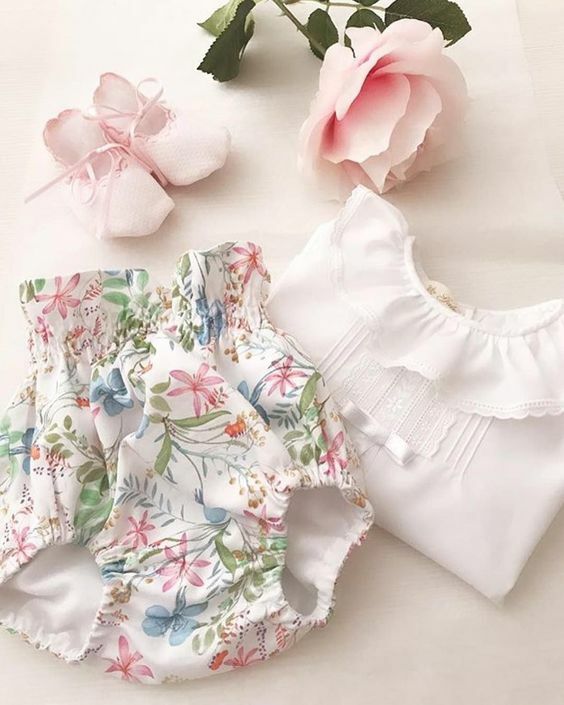 Check out the post for detailed construction and embroidery instructions. If you find it interesting or useful, I’d really appreciate a comment left on the blog. Like dishtowels, my favorite hostess or whatever gift, a laundry bag can be used even if it’s not in the recipient’s favorite colors. 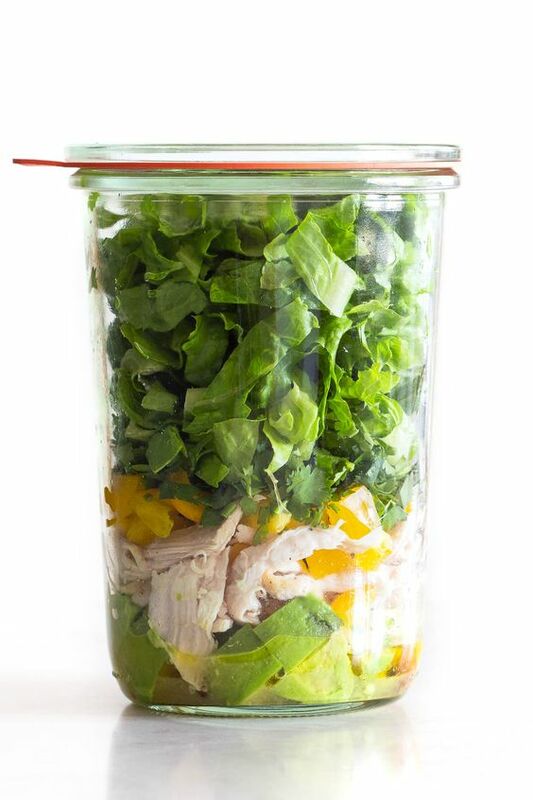 It’s good for children, campers, college students and even adults. I meant to make one for my elderly Aunt Aileen when she moved into a nursing home. Sadly, she left us before I got it made but I know she would have loved it. “Laundry bag” sounds so utilitarian and boring. But they can be a fun and gentle reminder for children (and others) to bag up those dirty clothes. 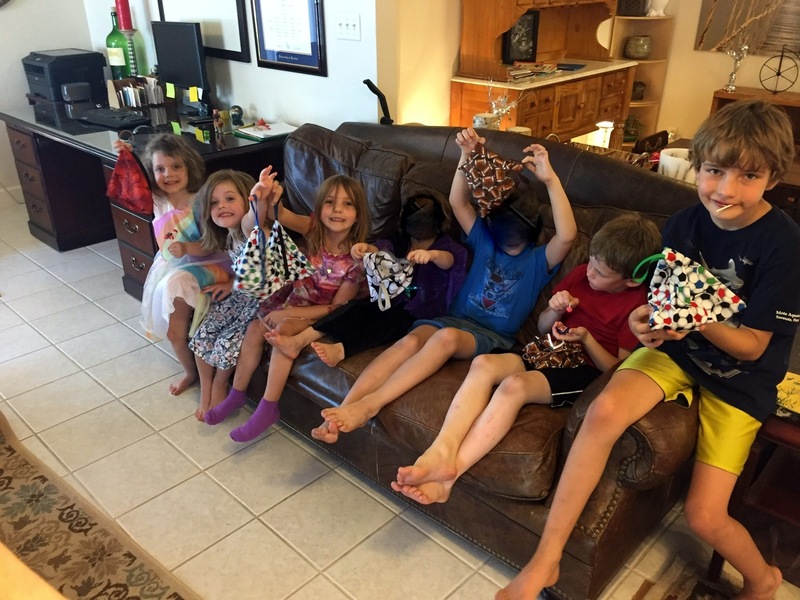 For each of my grandchildren I have made a bag and they are used regularly. When she was here for the weekend, 3 yo Vivian Rose asked where her laundry bag was as she put on her pajamas. With no reminder, she put that day’s outfit in the bag and went to brush her teeth. The black and white bags were made from scraps, left over from this super hero cape. Sometimes you can learn something that seems rather inconsequential at the time but, in fact, it turns out to be a pretty big deal. 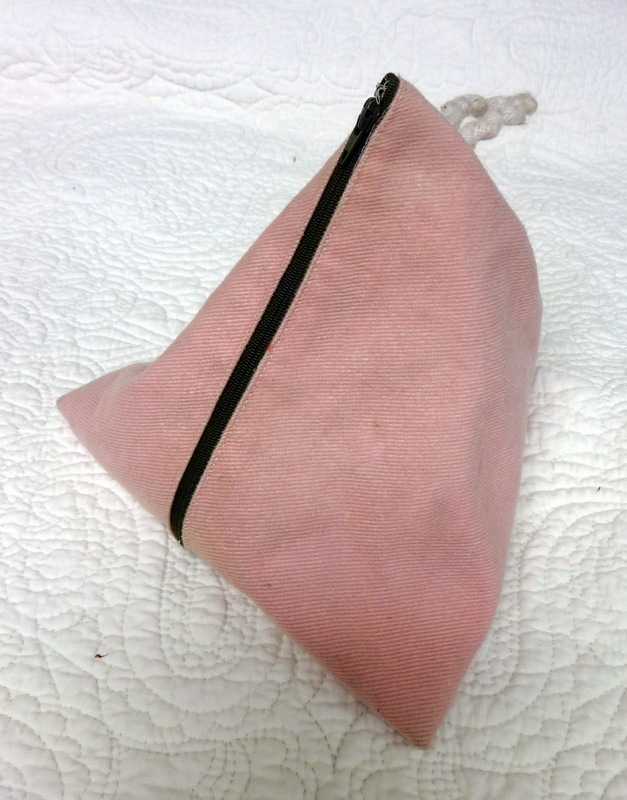 That’s how Mary Lou Nall’s “inconsequential” teepee bag project became one of the most useful sewing tidbits I have ever picked up. 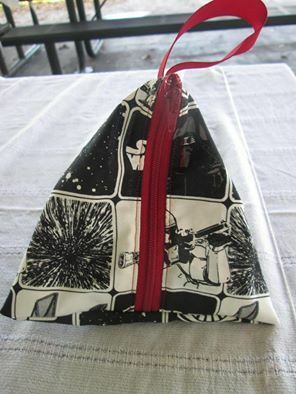 I still have the bag I made in that class more than 30 years ago! This grubby bag lives in my pleater box and holds my pleating supplies–screw driver, extra needles, small scissors, marking pen,needle threader, etc. Apparently, it’s long overdue for laundering. I guess I should wash it. I’ve raved about this before, but I’m compelled to it up again, since I’ve just made 38 more as party favors for grandson Alastair’s 7th birthday. 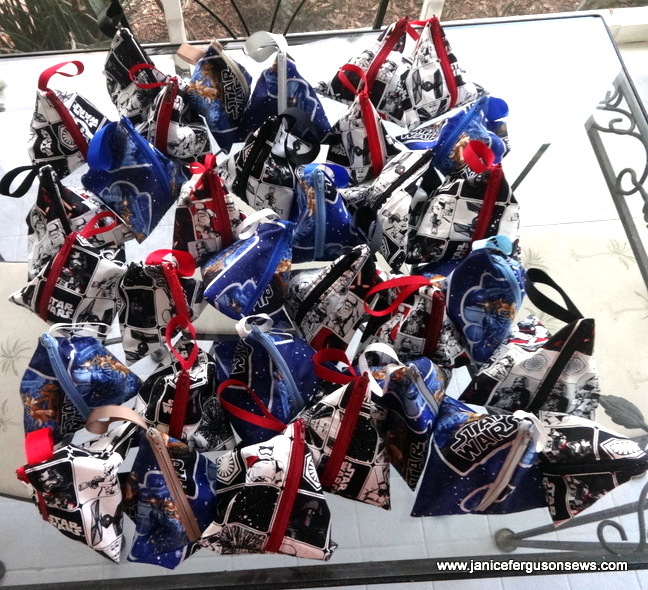 38 Star Wars bags for party favors. Zipper and ribbon color is varied which makes it a little easier for children to identify their own personal bag. From ho-hum plain to sweet with the help of machine embroidery and spaghetti bias. Lately, I’ve been in need of a variety of really fast projects, for a baby, a bride, a guy, a little girl and a young lady. I know of nothing faster than starting with ready-made blank items. I started with the baby gift. 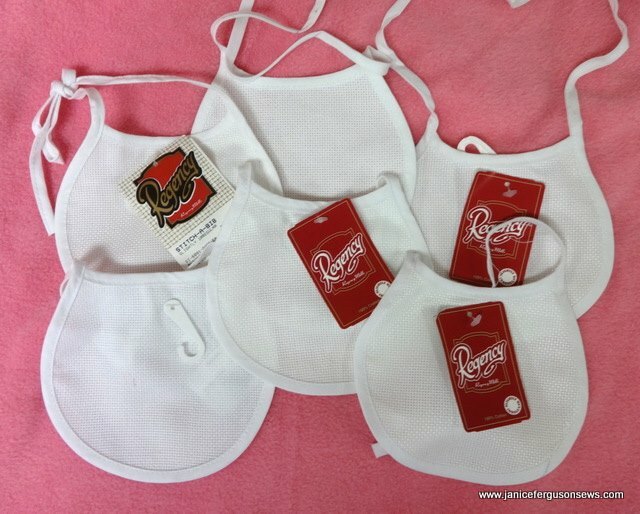 Years ago I bought several of these blank bibs, bonnets and caps made of Aida cloth or with Aida cloth inserts. You know how a technique strikes you suddenly. Machine embroidered cross stitch–yup! The plan was to embroider all of these bibs, bonnets and baby baseball caps. But that didn’t happen. 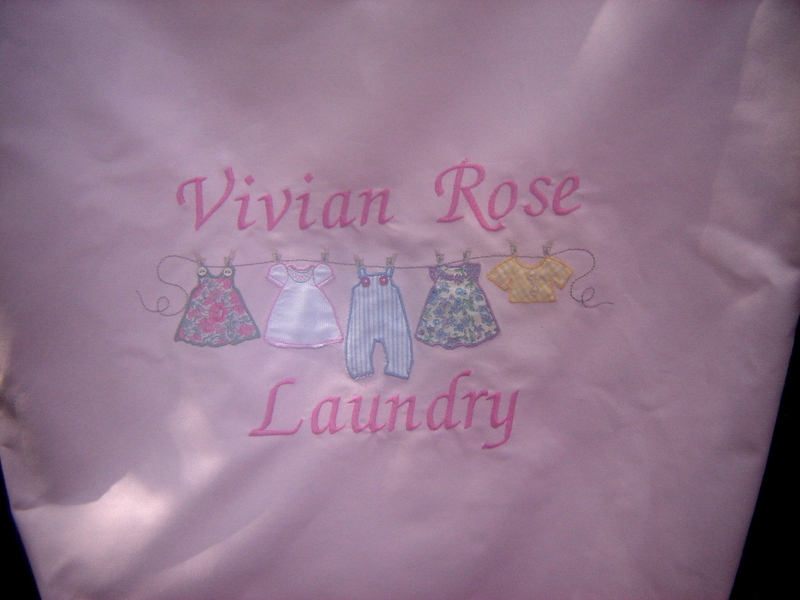 Oh, I did embroider several for the pregnancy center our church supports. But I sold most of them for a pittance. When the needs rolled in for these in-a-New York-minute projects, only one plain white one bib was left, though I’d rather have had one with blue gingham binding. Why does it always happen that you have things lying around for years, then once they are gone you need them ASAP? Who knows? 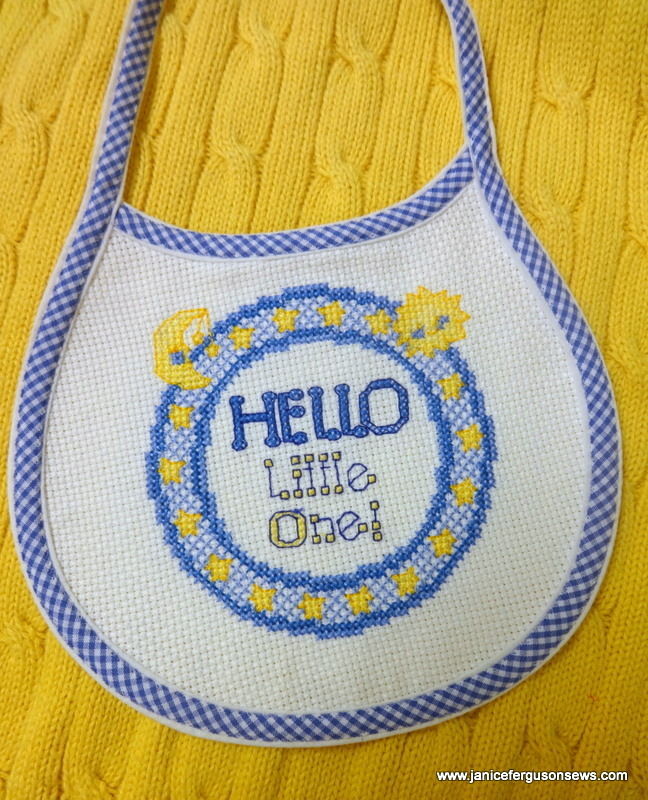 Even with the cross stitch embroidery, the white bib was boring. So I pulled out some spaghetti bias from my stash and stitched it right on top of the white bias binding. I was generally pleased with this little gift. It seems to me that cotton thread makes machine cross stitch look more like hand stitching. So the bib was stitched with 50 wt. DMC machine embroidery thread. I really like that thread. As a self proclaimed Old Fashioned Nana, cool isn’t a style I embrace. 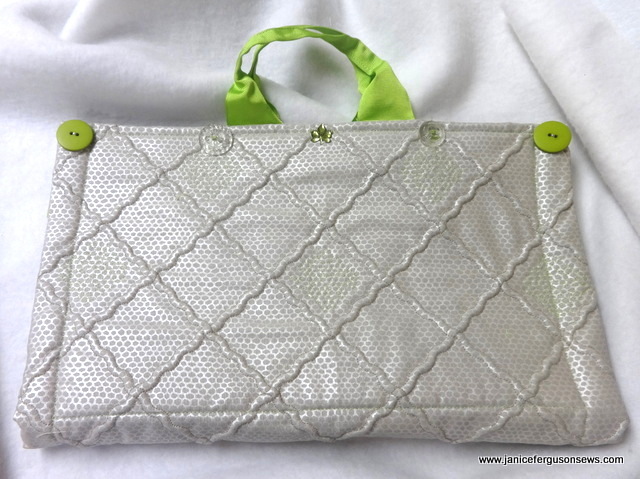 But this lime green and silver sewing machine tool bag really is cool. It looks almost futuristic, like something that should be a space shuttle carry on. Of course, if I were to fly to the moon in that big, scary bird I would take my Dream Machine along. And of course, I would need my accessories packed in this cool tool bag. 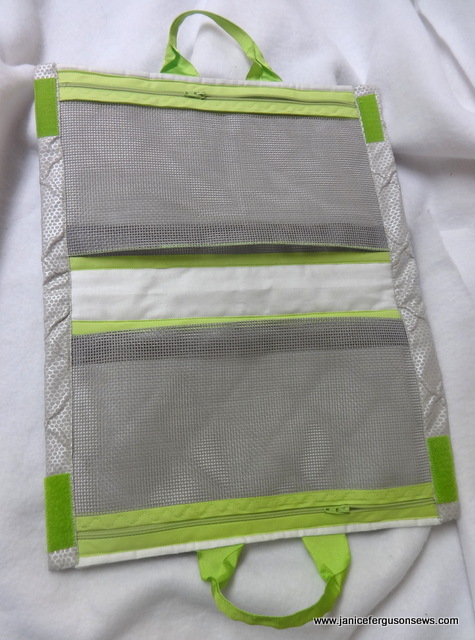 Notice the 1″ pleat at the bottom of each vinyl mesh compartment. That allows the bag to expand in order to accommodate bulky accessories like the walking foot. 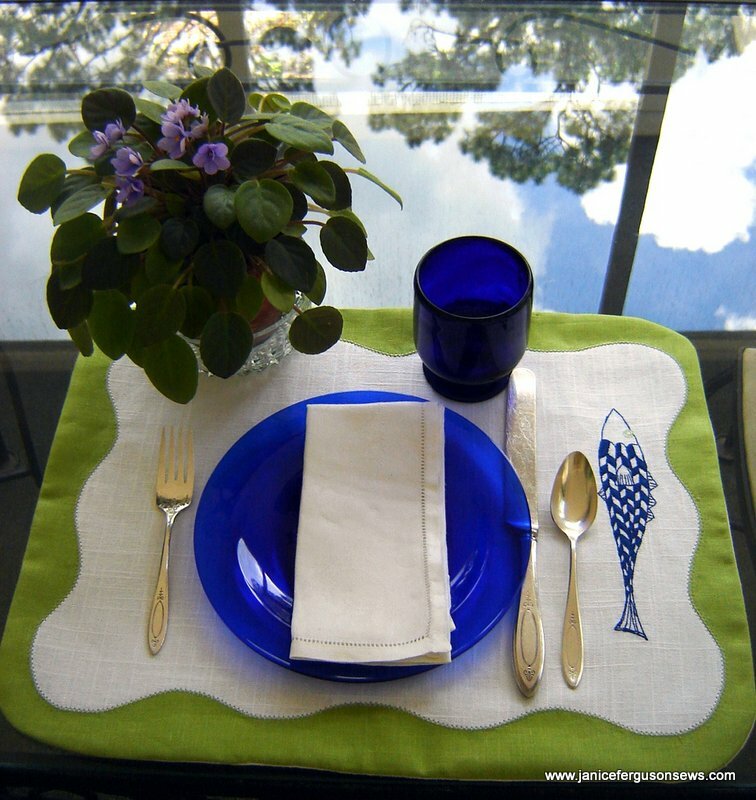 This project was designed and taught by teacher extraodinaire Lyn Powers at my home-sweet-home sewing store, The Sewing Studio , just outside of Orlando. I am so fortunate to live near enough to shop and learn there. The all-day class was one of a series of 8 for owners of Brother’s Dream Machine and Babylock’s Destiny. NOTE: If you have an extra minute, you might enjoy the little story at the end of this post. The bag is so useful! 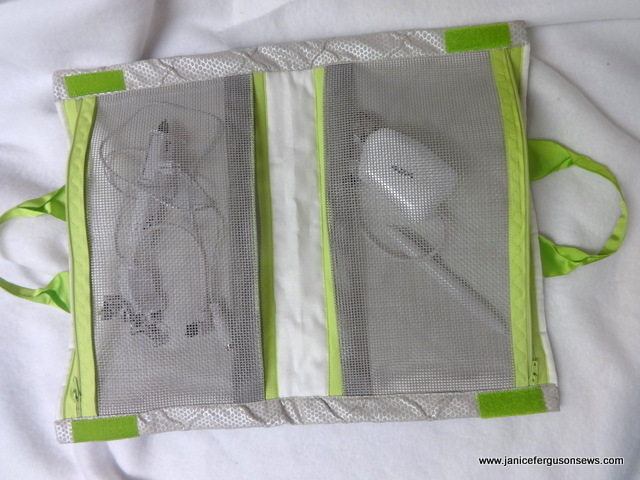 It holds those miscellaneous, fabulous tools that go with today’s sewing machine. Many of these do not fit in the machines’ accessory cases and many require careful handling. They really shouldn’t just rattle around loose in a drawer by the machine. The batting offers protection to these valuable accessories. Currently it is loaded with my walking foot, embroidery foot, and sensor pen with more to come. Who doesn’t love a wedding? For those of us who sew, it’s one welcome opportunity to make special gifts. 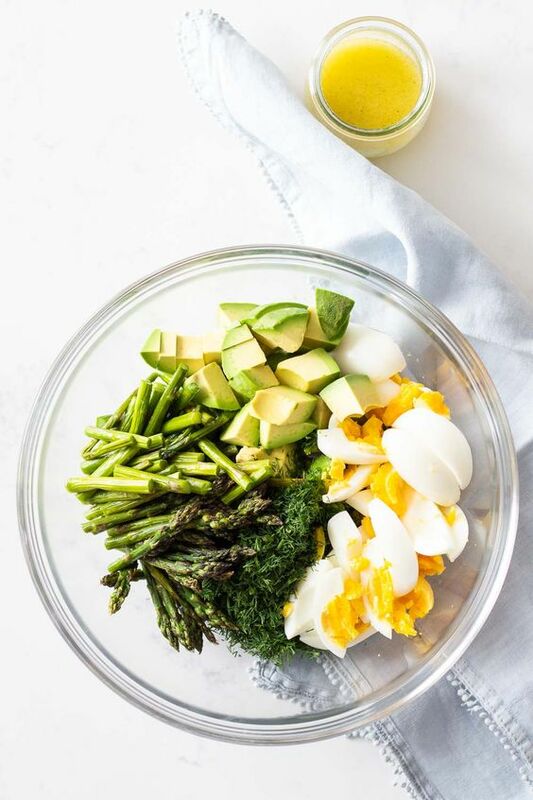 Sandee, my sorority sister (a neat discovery made through this blog! 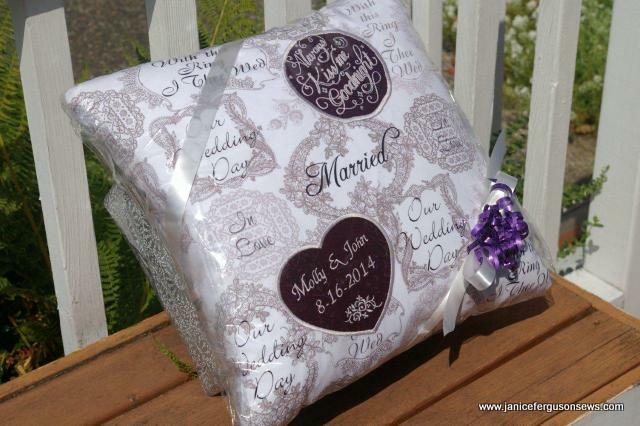 ), has used a fabric I covet to make some wonderful items for newlyweds. When she sent these gorgeous pictures to me, I just had to ask permission to share them with you. Can you imagine how pleased the young couples must have been?